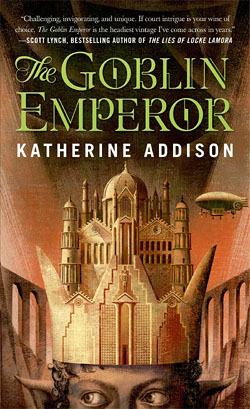 I really enjoyed The Goblin Emperor by Katherine Addison (Sarah Monette). I’m putting that right out front, because it would be too easy for you to think that I didn’t like it. And when I say that I really enjoyed it, what I mean is that on two of the three evenings I spent with the book I stayed up late because I just didn’t want to stop reading it. I didn’t want to stop reading it in spite of the fact that its hero can Do No Wrong: his only missteps are when, for a moment, he wants vengeance… only to chastise himself for taking the low road, even in his mind, which of course makes us like him even more. No, that wasn’t it. The thing that convinced me that I should not be enjoying the book is that it seems to mark the complete victory of Poughkeepsie. I haven’t read much fantasy of the medieval or ancient sort in the past three decades, apart from Terry Pratchett; and Pratchett is really in a class of his own. I used to read a lot of fantasy, but at some point, I think unconsciously, I just stopped. I’m aware that what’s popular in fantasy has changed over the years. I just wasn’t really there to see it. 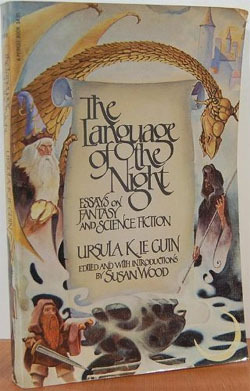 Back in 1973 Ursula K. Le Guin wrote an essay called From Elfland to Poughkeepsie. It’s really good; you should read it. In her essay Le Guin took a then popular fantasy author to task, very gently, for writing fantasies that didn’t need to be fantasies: fantasies that would work just as well if you pulled the fantastical characters out of the book and dropped them into Poughkeepsie. You see? The story and its dialogue would still make perfect sense, and would lose nothing, if they were placed in a fairly average modern day city. So The Goblin Emperor is populated by elves and goblins who do not need to be elves and goblins. They have a few unique twitches (involving ears) but that’s the only thing that differentiates them from humans. The exact same story could be told with a setting in the Chinese empire, the Roman or Ottoman empires, or pretty much any empire you care to name, with hereditary bureaucrats, a disadvantaged underclass, and court intrigues. It has airships, but the fact that they’re airships doesn’t matter; they could as easily be cruise ships or, I guess, buses, because the fact that they are airships is completely incidental. There’s a small amount of magic (two instances, possibly three) that does not need to be magic. A little gas would have done the same thing. My point is that this is a fantasy novel – a very good and enjoyable fantasy novel – that doesn’t depend on fantasy for anything that matters. It’s a very strange situation, but there it is. It’s Poughkeepsie. What seems even stranger to me is that nobody seems to have noticed this, and I guess the reason why I’m surprised is that I just haven’t been paying attention to fantasy books. This may be what’s normal and expected now. So The Goblin Emperor has given me a lot to think about, which is something that I like in a book. Such as: is this a bad thing? It’s an enjoyable book, so is it important that the fantasy elements be necessary to the story? And I’m still not sure. You could say that fantasy has been mainstreamed to the point that a fantastic setting can simply be taken for granted, the way power lines and cars are taken for granted in a modern day mystery. But there’s something about that which makes me uneasy. It bothers me that a book can be both fantastical and mundane. So after many years I’ve re-read From Elfland to Poughkeepsie, to find that Le Guin was mainly concerned about dialogue and prose style (and she would probably approve of those, I think, in The Goblin Emperor). The rest – my expectation that the fantasy elements of a fantasy story can’t be separated from the story without turning it to nonsense – that’s all me, I guess. But it seems like a natural progression. If you start out in Elfland but head in the direction of Poughkeepsie, it shouldn’t be any surprise to find that you’ve arrived there: that everything around you now sounds and smells and feels like Poughkeepsie, in spite of the bit of glamour that’s laid on top; in spite of the fact that, now and then, your ears twitch. So maybe – because I skipped the many miles that have passed between the late eighties and the present day – I’m just really surprised to see where I am. As I said at the start, I liked the book. Weeks later, I’m still thinking about it, and to me that’s a very good sign. So this isn’t a criticism: this is just a question that I’m asking myself. Let us consider Elfland as a great national park, a vast and beautiful place where a person goes by himself, on foot, to get in touch with reality in a special, private, profound fashion. But what happens when it is considered merely as a place to "get away to"? Well, you know what has happened to Yosemite. Everybody comes, not with an ax and a box of matches, but in a trailer with a motorbike on the back and a motorboat on top and a butane stove…. They arrive totally encapsulated in a secondhand reality. And then they move on to Yellowstone, and it’s just the same there…. … The same sort of thing seems to be happening to Elfland, lately.